The pictured items are between 3 and 5 inches long. The miniature folk art furniture pieces are handmade of tin cans. Couch, table, and rocking chair. The stool is made from a from beverage can. The technique is known as quilling, where thin sheets of material(in this case tin cans(waste not, want not) were cut into strips then made into doll furniture. Yes, they were sharp, but I would imagine the person making them ran the strips along a sharpening stone to soften the edge first, then assembled the furniture. 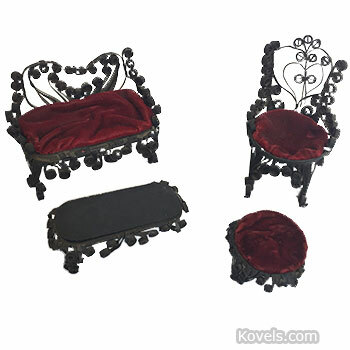 Looks like doll house furniture for wealthy households. These were a very popular craft in the 1970’s. They were made from soft drink and beer cans. Very easy to curl the cans because they were thinner than food cans. I have several made by my Aunt! I recon these are dolls' furniture in (very Victorian this) human hair. I have one passed down by a relative who has since died. Are they worth anything?